" 'A gripping story: There cannot be many clearer or more detailed accounts of the operations of the French resistance, and Hue's death-defying adventures make for riveting reading' New Statesman Andre Hue was something of a daredevil. By the age of twenty the Anglo-Frenchman had survived shipwreck and years undercover in France, sabotaging German supply lines. Returning to Britain, he was recruited by SOE to parachute behind enemy lines on 5 June 1944, to unite resistance forces in Brittany and paralyze local German troops during the Allied invasion. 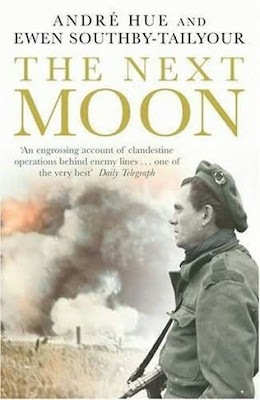 Though Hue’s mission was fraught with difficulty – he missed his landing site, his secret base camp became the site of a pitch battle and a band of Cossacks tried to hunt him down – he knew that thousands of lives depended on his success or failure." What I'm going to do is work my way through the book, visiting or in some cases revisiting the places mentioned in the book, If you don't have a copy its worth buying, on Amazons web site there are copies for sale from 60p (Sterling), click on the link on the right hand side of this blog. 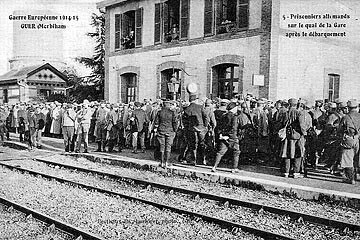 I was searching the internet for some information and older photographs of the railway station at Guer where André worked, its was from here he started working for the French resistance, I wanted some old pictures to put along side the photographs I will take of some of the places I visit, I found this, its a picture from 1915, German prisoners of war at the station at Guer.